A dark, snaking line across the lower half of the sun in this image, captured by NASA's Solar Dynamics Observatory on Feb. 10, 2015, shows a filament of solar material hovering above the sun's surface. A dark line more than half a million miles long curves across the lower half of the sun in a gorgeous photo snapped by a NASA spacecraft. The line is what scientists call a solar filament, a large region of dense, cool gas held in place by magnetic fields. If stretched into a straight line, the filament would be more than 533,000 miles (858,000 kilometers) long, according to NASA officials — the equivalent of about 67 Earths arrayed side-by-side. NASA’s Solar Dynamics Observatory (SDO), which took the image on Feb. 10, registers colder materials in the sun's atmosphere as dark, and hotter materials as bright. "SDO captured images of the filament in numerous wavelengths, each of which helps highlight material of different temperatures on the sun," NASA officials wrote in a description of the image. Capturing images of filaments at different wavelengths and temperatures helps scientists learn more about what causes them. Red images, which highlight plasma at temperatures of 90,000 degrees Fahrenheit (50,000 degrees Celsius), are good for observing filaments as they form and erupt, NASA officials said. The Feb. 10 filament was plenty big, certainly, but the sun has hosted even larger ones in the past. 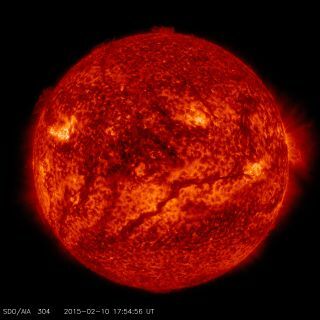 In October 2014, for example, SDO spotted a filament 1 million miles long — more than 100 times the width of the Earth and longer than the diameter of the sun, which is about 865,000 miles (1.39 billion km). Filaments, though sometimes benign, can be explosive. When filaments break through the sun’s atmosphere, called the corona, they release a shower of solar plasma particles that either rain back down to the sun’s surface or escape into space and become a moving cloud called a coronal mass ejection (CME). On Sept. 2, 2014, SDO captured video of a solar filament eruption thought to have sent a wave of solar particles toward Earth. CMEs that collide with Earth can generate geomagnetic storms that interfere with electronics, cause radio blackouts and create stunning auroras.